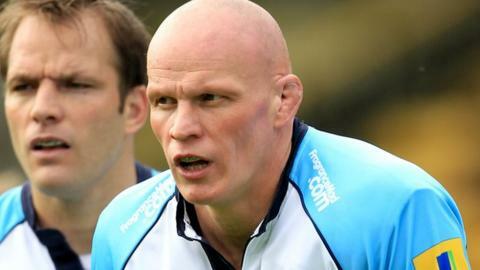 Worcester forward Craig Gillies says they are improving despite being winless so far this season. The Warriors' comeback against Northampton at Franklin's Gardens on Saturday gave them two bonus points after being 37-3 down at one stage. "We're changing the way we've traditionally played," Gillies told BBC Hereford & Worcester. "Slowly it's coming and, with a little more belief and confidence, we can keep building week on week." Gillies, who was one of a string of second-half substitutes that sparked four tries in a sublime 16-minute spell, continued: "The type of rugby we played at the end on Saturday is what we'd like to hang our hat on this year. "If we'd gone out from the first whistle and played that sort of rugby it could have been different. "It almost seemed like we'd come away with some sort of victory." As it was, the four late converted tries they got from Jonny Arc, Josh Matavesi, Josh Drauniniu and Ollie Hayes could yet act as a rallying cry for the rest of the season as Richard Hill's reassembled side seek their first win. Apart from Saturday's narrow defeat at Northampton, they have also lost gamely at Leicester, as well as drawing with Gloucester and suffering a frustrating opening-day defeat thanks to a last-minute penalty against Bath. "In situations like this, it's usually about fighting fires and damage limitation but all the guys that came on really made their presence felt," Gillies added. "We finished quite strong and had some good territory. "And we haven't had a try bonus point in a very long time. "To get four tries was an achievement in itself," said the club's all-time record appearance holder. "But to get an extra point for finishing with seven points made it even better."